A new console version of Diablo 3 may have been revealed by the ESRB. There might be a new console version of Diablo 3 on the way soon. The news comes from an ESRB listing for the Diablo III: Eternal Collection. Shown as coming to PS4 and Xbox One, the Eternal Collection received the same Mature rating that other versions of Blizzard's action-RPG have garnered. However, the listing doesn't reveal just what might be included in this new edition. Of course, there is some new content looming for Diablo 3. The Rise of the Necromancer DLC is coming soon, with Blizzard having just revealed the intro cinematics last week. That timing makes me think that this new console release could be a collection of the base game and all the content that has been released for it, including the Necromancer DLC. There's no date know for the Diablo III: Eternal Collection, as Blizzard hasn't even officially announced it yet. That said, you can bet that once we learn a date for the Rise of the Necromancer DLC, the Eternal Collection won't be far behind. I'd originally had Diablo 3 for the 360, Ultimate Evil Edition barely got a pass because it had a ton of new stuff and I needed to re-buy the game for the current gen anyways. But buying the game yet again for the same console for a new class alone? That's a hard no, hopefully they make it available as a separate purchase but history doesn't seem to suggest that. Depending on how it's priced I might consider it, given the last I played - and really enjoyed - of Diablo 3 was on 360. But if it's ?45-?50 again, then no, sod off I'll [probably] just get Reaper Of Souls for under twenty. 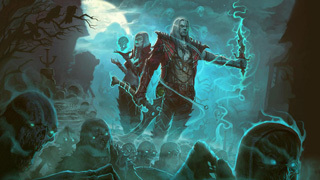 We're still waitin' to learn when the Necromancer pack will arrive, and how much it'll cost. I know this wasn't an official reveal, but it's a little early to be cheerleading the next all-encompassing combo box. First thing's first. typical.. i picked up the retail complete edition a couple of weeks ago and then they announce this.. damn you linear time ! I just figure the Necromancer will be 15$ or something.